Bravo! This is one of the best performances I’ve seen in the seven years that I’ve been reviewing. The house was packed on opening night. 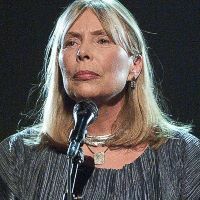 Joni Mitchell turns 70 this year and she is honored by a concert that is remarkable. The vocal harmonizing by these six talented artists was amazing. Their musical skills were remarkable and the song compositions and choreography were excellent. They make these songs their own, done with complexity, genius actually, unlike Joni Mitchell's folk style. The setting is so warm and inviting with Persian carpets adorning the stage with a big wooden wheel on which hung a variety of musical instruments. It is so 60s. The performance is so good that time just flies by. It has a smooth steady pace and each arrangement is done with a new freshness that it makes these renditions of the songs seem like they’ve invented a new genre of music. The six performers’ harmonizing so beautifully together was magic. Ravalli’s interpretation of a sultry seductress deserves an applause by itself. I was impressed by the quality and richness of all the voices. The three gals and three guys held us fascinated for the entire evening. The stage sound and lighting was wonderful. Joni would be so pleased to see this magnificent show on her works. I impressed by that fact that these performers could play so many instruments on an individual level. There was of course a well deserved standing ovation and so the cast of six charmed us with another composition to end the show. My congratulations go out to the directors and the entire crew for an exquisite performance. I will always remember tonight as one of the best music concerts held in Vancouver.